Soon after leaving Hawaii Volcanoes National Park, the weather changed from a light drizzle to a heavy downpour that stayed with us throughout the morning. We were fine with that, as we didn’t have a lot of plans for our drive up the Windward coast. 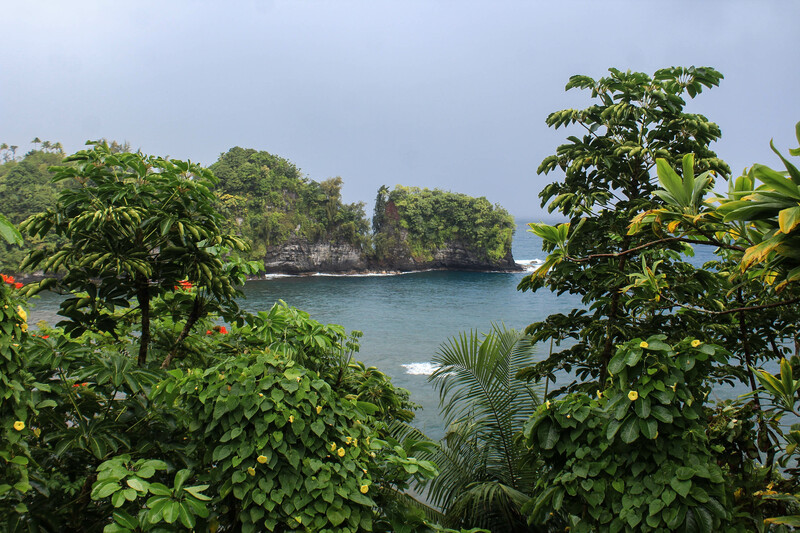 There were waterfalls, beaches, or short hikes we could have done, but as we drove through Hilo and the rain continued to fall, we decided to bypass them all. We certainly weren’t complaining after having 5 days of perfect weather for our big hikes. Not only that, but this is honestly the only bad weather day we’ve had in all of our island hopping experiences. We were totally content with a long road trip around the island. I will say that while driving, I realized there is one thing I like more about Oahu than the Big Island. Obviously the Big Island has the huge advantage of more space and less people, but I felt that it was lacking in the impressive, striking views that the Windward coast of Oahu boasts. Sure, there were deep valleys and tall waterfalls, but I wasn’t in awe as I am every time I look at the Ko’olau Mountains. That being said, we didn’t stop to see the Pololu or Waipi’o Valleys on the North shore, which boast the more dramatic cliffs that we love to see. Once we passed through Waimea on our counter-clockwise island road trip, the rain disappeared and the sun quickly warmed us up. We arrived at our first historic site of the day — Pu’ukohola Heiau National Historic Site, just North of HI 19 on 270. The sun shone brightly over the drier Leeward landscape, and the ocean was a gorgeous deep shade of view. We applied plenty of sunscreen before beginning our tour of this historic site. In 1782, three years after the death of Captain Cook at Kealakekua Bay, Kamehameha I began the process of fulfilling a prophecy told about him: that he would one day unify the Hawai’ian islands under one King. That year, Kamehameha began to unite the northern districts of the Hawai’ian islands but was unable to defeat his cousin, then in control of the Eastern side of the island. In 1790, Kamehameha visited a great Kahuna who recommended that Kamehameha build a great temple, a heiau to the great god Ku. 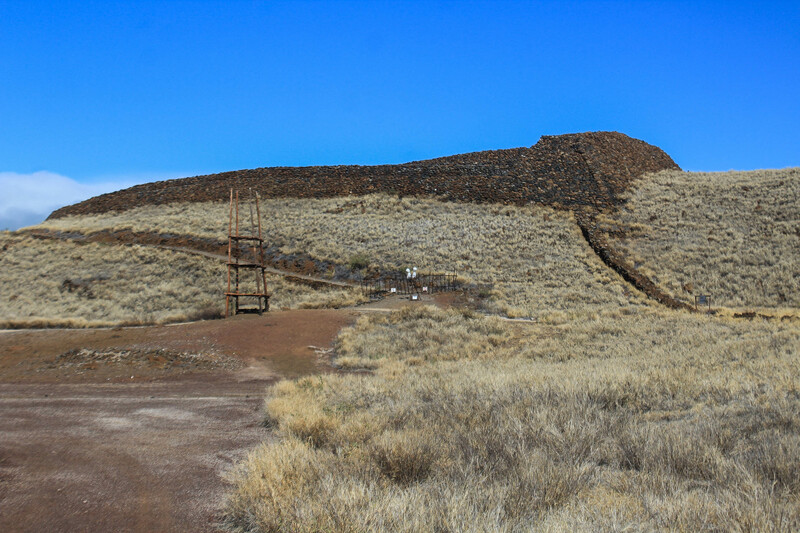 Convinced, Kamehameha began construction on Pu’ukohola, the hill of the Whale. Transporting stones from the north shore in a 14 mile human chain, the temple was complete within a year. Upon the inauguration, Kamehameha’s cousin arrived by sea, possibly as a brokerage for peace, possibly as a way to surrender following the loss of his army to an eruption of Kilauea. As he arrived, one of Kamehameha’s chiefs attacked the cousin, ultimately slaying him and his party. And so, Kamehameha became the sole ruler of Hawai’i. Over the next 5 years Kamehameha and his army conquered the islands of Maui, Molokai, Lanai, Kaho’olawe, and Oahu, culminating in the battle of Nu’uanu on Oahu. 15 Years later in 1810, the islands of Kauai and Ni’ihau became vassals to King Kamehameha and the Kingdom of Hawai’i. The Heiau remained an active religious site for the duration of Kamehameha’s reign, but after his death in 1819, his son Kamehameha II, under the guidance of Kamehameha I’s wife, abolished the Hawai’ian religion and with it the use of Heiau. 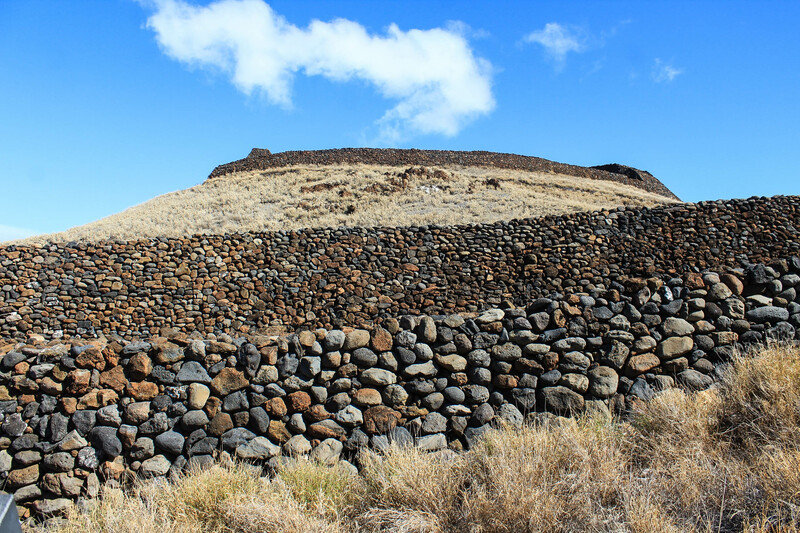 Like many of the other religious sites, Pu’uokohola Heiau was dismantled with the exception of the stone platforms. The platform were protected by some of the royal family throughout the 19th century until eventually being designated as a National Historic Site and preserved today. Today, visitors are allowed to walk around the heiau (but not on top), as well as see some of the other ruins nearby: a fort that was used for coastal defense during the 1790’s, the remains of a royal court, and, off shore, the remains of another Heiau used centuries before this. The park also features a great audio tour which we took advantage of. After our visit here, we continued driving South on 19 down to Kona. Just South of the airport was our final National Park site of the trip, and last item on our Big Island bucket list, Kaloko-Honokohau National Historic Park. We arrived just 45 minutes before the visitor’s center closes at 4, but were able to complete the short paved walk around learning about this site. There is more to see on the coast, so we left the main parking lot and drove to the Kona Sailing Club lot just South of there because we wouldn’t risk getting locked in here. 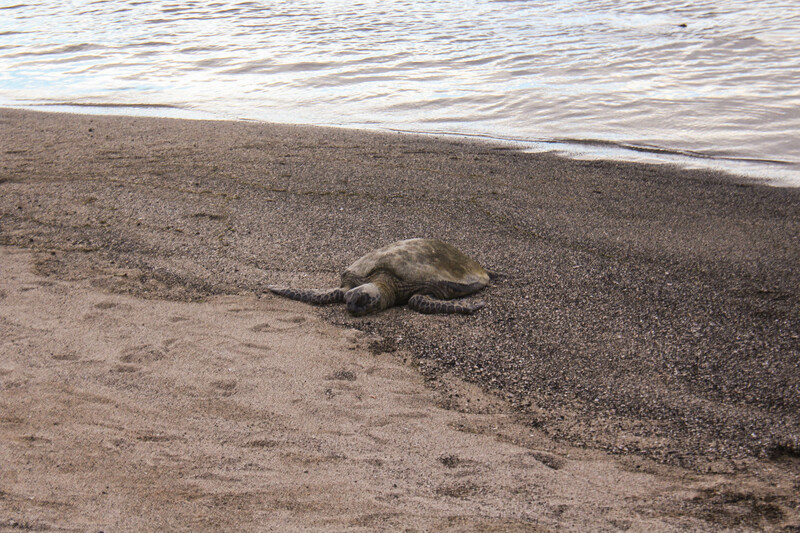 On the coast there was a bit more to see, but the real highlight was finally seeing my first sea turtles in the wild! I can’t believe it took over a year for me to see one, but here at this beach we lost count after 10! This last historic site commemorates more the entirety of the Hawai’ian lifestyle and religion than an individual historic site. The site is around the remains of one of the many settlements and ahupu’a (land divisions). 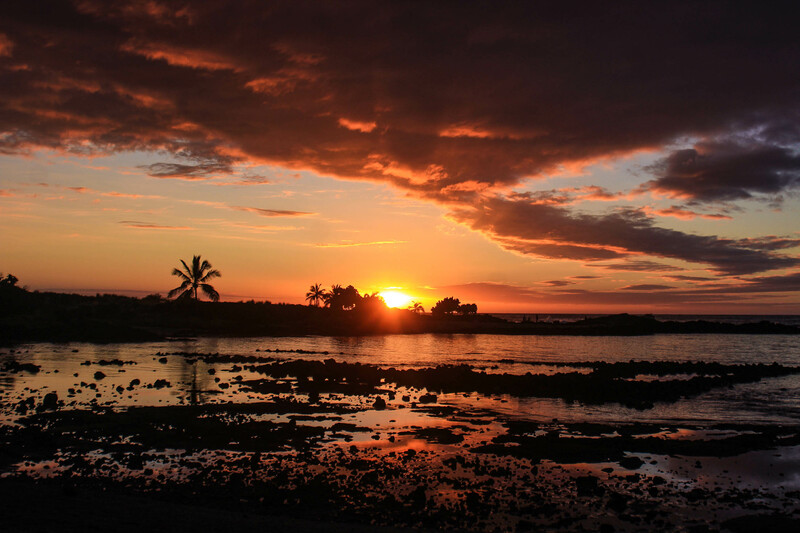 Mostly, the focus is on the coast and the fish ponds with a couple lesser heiau. We were growing hungry after just snacking all day, so we drove into Kona to grab dinner before the sunset. We got kalua pork tacos, burrito, and nachos from Killer Tacos — all delicious and a great value for the price. To wrap up our day, we drove back to the beach and watched the sunset — our island hopping tradition. We enjoyed the bright vibrant colors, as well as spotting Haleakala North of us. We then said goodbye to the Big Island, returned our rental car, and waited at the airport for a few hours for our 9:30 flight. The nice thing about this trip compared to our vacation to Kauai was that Curtis had 2 weeks of a much lighter schedule for Christmas break rather than jumping right back into work!